Synopsis: Eighteen-year-old Azalea “Oz” Buchanan was expecting to coast through her senior year. But everything changes when an old childhood friend goes missing and turns up dead. Suddenly, her best friend seems to be going crazy, her parents are keeping secrets and a weirdo with a Wizard of Oz fetish is stalking her. ​With a nosy (but cute) reporter and a dirty cop breathing down her neck, Oz must rely on clues left by a dead girl to figure out who the killer is before he comes after her next. ​Everyone in her life is keeping secrets and it’s only a matter of time before Oz realizes not all blood is thicker than water. 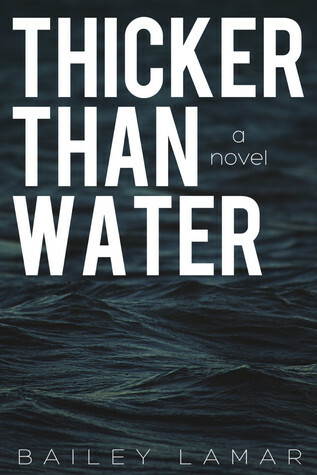 About the Author: Bailey Lamar is the author of THICKER THAN WATER, a young adult thriller that will be published sometime in late 2016 (release date pending). When she's not writing, she's spending time with her best friend, reading, watching makeup tutorials she will never try, taking pictures of other people (and herself), watching crime dramas on TV or pretending to write. Review: I will confess, I'm not a BIG mystery fan, but this is just keeping me so engaged and drawing me on it's hard to remember that I'm not usually a big fan of this genre. (Which as anyone who knows my reading habits will tell you, is a big thing). I could easily see myself picking this up because the cover is interesting, and just getting lost in it. The characters are believable as the ages they are, and act within the parameters you seem to have set for each of them. I can really identify with the main character when I was her age. Bailey did an amazing job of capturing the inquisitiveness, angst, confusion. I'm really impressed. This has hooked me in a way very few novels ever have.